A few days back the following Facebook post caught my attention. Racist whites occupying a VIP booth, drunkened, by the third period of the game lashed out against grade school ice hockey students. The students attend The American Horse School (K-8th grade school) on the Pine Ridge Indian Reservation. When will the nation in aggregate stand against increasing reminders of our past. More specifically when will white people stand tall against such exhibitions fro other whites? It will take that part of the "village" to push overt racism back to individual closets hidden fro a word view. A reminder of our past and an update on the VIP booth racist. Whites, beer, Ice Hockey and the all too familiar exhibition of racism. 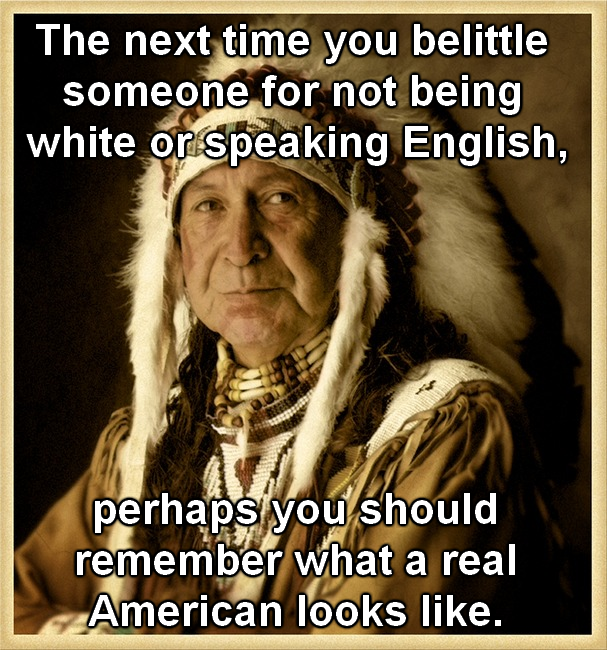 In this case, the perpetrators were insensitive enough to reach back to US genocide and Manifest Destiny against Native "original" North Americans. Manifest Destiny, stolen land, gencode against natives of North America, settle the land, sell the land and relegate the remaining Manifest Destinyo reservations (forever). What is the psychic composition of the American racist? How have denizens of the nation allowed society to metastasize into its manifest stages of regression? Is there a core nucleus of the increasing exhibitions of outright racism and callous race based acts? Is it possible exhibitions as posted above are the acts of illiterate dimwits and closeted race monsters who only come-out at the Full Moon? If you subscribe to the American racist as that of the diminutive intellectually derived, think again. American racism is alive and well and flourishes like a Kudzu field in Southern America. A shortened verison focused on racist Buchanan's white natiaonationalist views. Did you notice Buchanan reached to "Ice Hockey" As (as he perceives the domain of the white athlete? You may have also observed how he perceives the black Olympic athlete (runs fast). Let's visit with follow-up regarding the Ice Hockey "go back to the rez." . “They were getting drunk and around the third quarter they were talking crap to our kids and throwing down beer on some of them, including our staff and students … telling our students to go back to the rez," Poor Bear wrote. Poor Bear told KOTA he was upset during the incident and was "invited" to "fight about it" by the fans hurling beer from the VIP section. Police said they have identified one of the men involved in an alleged verbal and physical attack on 57 Native American children at a hockey game in South Dakota and are investigating it as a hate crime, KOTA reported Wednesday. The case involves potential charges of assault, hate crime and child abuse, Rapid City, S.D. Police Chief Karl Jegeris told the station. The children were attending a Rush hockey game on Saturday as part of a school event when belligerent fans reportedly began pouring beer on and shouting racial slurs at them. According to one of the chaperones, the fans told the students to "go back to the rez." After the incident, the students were escorted out of the arena by chaperones and on Tuesday the school's board filed a complaint with Rapid City police, KOTA reported. I seriously hope no one reads this and comments above "They were drunk." Drunk does not instill deep psychic values; drunk releases deep rooted values via lowered inhibitions. Think of the lessons these kids learned so early in life. They learned a lesson about a group young minds.